The ‘pieces of the puzzle’ metaphor is well-used, but applies easily to the Ebola response in Eastern DR Congo. So many diverse pieces are needed in order to make the response a success, bringing the outbreak to a swift conclusion. One of those pieces is effective screening and isolation of suspected cases. Health facilities can either be instrumental in responding effectively to the outbreak, or they can become hotspots that facilitate the spread of the disease. In mid-August 2018, Medair received news of a patient with suspected Ebola, who was treated on the general ward at a hospital close to the epicentre of the outbreak. The person was a doctor who had been working at a nearby health centre. He recovered and returned home, but days later his wife was admitted, then referred to an Ebola Treatment Centre where it was confirmed that she was suffering from Ebola. Keeping such a patient on the general ward meant that health workers and fellow patients ­­were exposed to the severe risk of contracting Ebola. We do not yet know if these contacts will develop Ebola. To avoid recurrence of such lapses, it is critical that health facilities are equipped to screen all people entering the grounds, and to immediately isolate them if they have symptoms matching the Ebola case definition. An ambulance with a specialised team can then be called to take the patient to the nearest Ebola Treatment Centre for testing and treatment. This is simple in theory, but can be complex to put into practice. The majority of health facilities in Eastern DR Congo have open access, usually with several possible entry points. People come and go at great frequency for consultations and to visit patients. 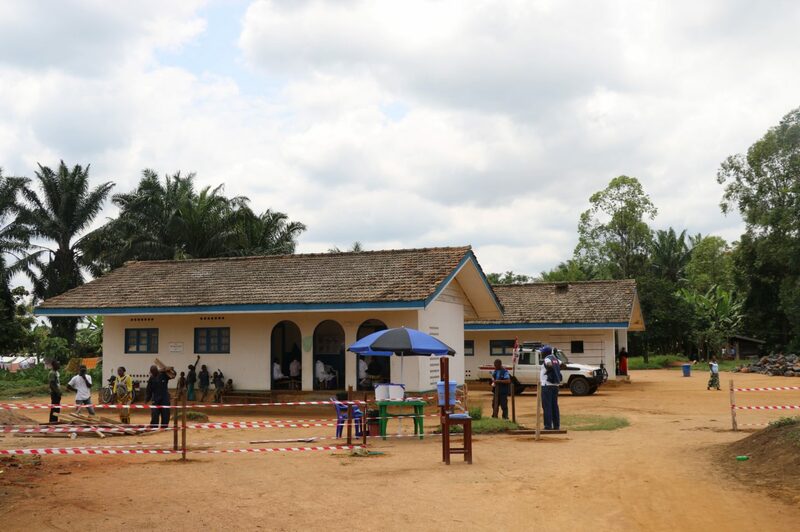 To ensure that all people are screened, a screening point must be established at the main entrance of the health facility, along with a perimeter fence ensuring that all people entering the health facility grounds pass by that point. With staff at the screening point well-briefed on the Ebola case definition, and equipped with contactless thermometer and light personal protective equipment (PPE), suspected cases can be isolated and referred quickly, without the risk of them infecting anyone within the health facility grounds. Medair’s current focus in the response is to establish screening point and fencing at select health facilities in Oicha and Beni health zones. While the majority of cases continue to be found in Mabalako health zone, confirmed cases have emerged in Beni and Oicha health zones also. It’s imperative that the outbreak be quickly fenced in, with health facilities equipped to screen for cases before these cases arrive.